Steve Spaleta, Space.com senior producer, contributed this article to Space.com's Expert Voices: Op-Ed & Insights. 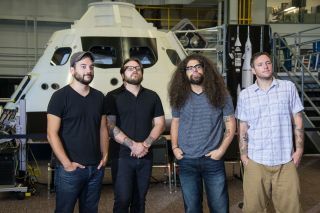 Rock band Coheed and Cambria has sailed the skies of sci-fi for much of the group's 14-year career. Starting in 2001, with the album "The Second Stage Turbine Blade" and later with albums "Good Apollo, I'm Burning Star IV," "The Afterman" and more, the band has taken space-themed conceptual music to a new frontier. To create those records, the group's founder, lead singer and guitarist, Claudio Sanchez, converted his own life experiences into fantasy-driven song concepts, he said. Now the band has come down to Earth. Coheed and Cambria's latest effort, "The Color Before the Sun" is the group's first non-sci-fi concept record. But that didn't stop Sanchez from "leaving" the planet for his muse. "I am definitely influenced by anything off of this planet," Sanchez told Space.com. "There is something about space and the unknown universe that is inspiring." He added that "The vastness…[and] the unknown is a creative trigger for me." This can plainly be seen on the new record's fourth track, "Here to Mars." Sanchez deploys cosmic references, emphasizing his commitment to the song's subject. A lyric video, created to promote the song and album, incorporates stellar and planetary animations to illustrate the point. "The Audience," another track from "The Color Before the Sun," references "burning stars," while the lyrics "Good night moon, good night Earth" from the song "Young Love" could strike a chord with space-enthused listeners. Recent space-related events in the news have captured Sanchez's imagination, he said. Speaking of NASA's discovery of water on Mars, which the agency announced in late September 2014, he said, "Chondra, my wife, and I were talking the other day about the discovery of [water on Mars], and the idea that maybe there was life there at some point. … All of that speculation creates a fantasy, and for me the fantasy is very much a driving force, creatively." Sanchez touched on NASA's exploration of Pluto as well. "It's incredible to me, that at one point, Pluto felt like the edge of the galaxy," he said. "But it's only the edge of our solar system." Sounding an existential note, he added, "We are so small that we cannot fathom the enormity of space, which can be frightening, but also inspiring." Coheed and Cambria is currently prepping for a world tour for the band's new record. Though the band members may not be on their conceptual "Amory Wars" starship, they'll certainly be bringing pieces of space with them. Follow Steve Spaleta on Twitter @SteveSpaleta. Follow all of the Expert Voices issues and debates — and become part of the discussion — onFacebook, Twitter and Google+. The views expressed are those of the author and do not necessarily reflect the views of the publisher. This version of the article was originally published on Space.com .